Aaron got the opportunity to join Impact Justice at the company’s inception in 2015 and took on the multifaceted role of Operations and Project Manager, where he oversees the core administrative team and coordinates projects in the Impact: Innovations suite. 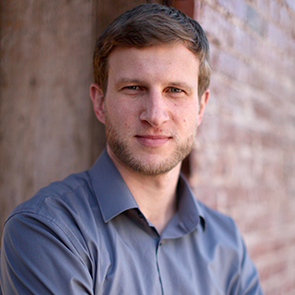 Aaron Juchau began his career working in renewable energy and energy storage at Strategen Consulting. Working his way up to the position of Senior Analyst, Aaron led the creation of the DOE Global Energy Storage Database–a database of energy storage projects–on behalf of the US Department of Energy. He also assisted in the management and member relations of the California Energy Storage Alliance, and provided analytical support to major grid and tariff analysis projects for Strategen’s customers. Aaron left Strategen in 2013 to begin a career in criminal justice reform, subsequently interning with the Drug Policy Alliance, Law Enforcement Against Prohibition (now Law Enforcement Action Partnership), and the Center on Juvenile and Criminal Justice. In 2014 Aaron was hired as the Executive Assistant to the President at the National Council on Crime and Delinquency. Aaron studied Political Economy at UC Berkeley.